This Double Sided Clamp Stand - Silver is a great portable stand that can be assembled in minutes. The stand consists of a 11" round base plate and 2 aluminum tubes with a 1" diameter that screw together for a 72 inch total height. The stand comes with a set up double sided clamps that have a tension knob to adjust the height of your signage. Add an extra set of clamps and display two signs on each side of the stand. 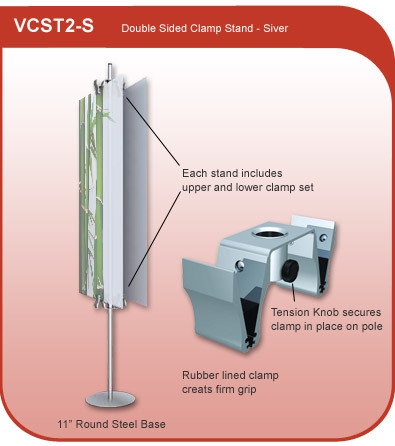 The model VCST2-S is made of 1" diameter aluminum tubing and the base has an inner bushing to create a secure connection and give the stand stability. Need this product in larger quantities? Click here for bulk purchases!